Washington, DC — The Swiss International Congress in Anti-Aging and Aesthetic Medicine and Surgery (SICAAAMS) will be hosting its 3rd Annual Cutting Age Advanced Body Aesthetics conference. Hosted at the Intercontinental Hotel in Geneva, Switzerland from April 19-21, 2012, the event will feature over 40 practical sessions, live demonstrations, and teaching courses in anti-aging medicine, aesthetic medicine, and aesthetic surgery. 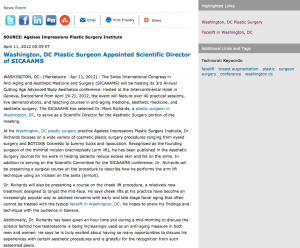 The SICAAAMS has selected Dr. Mark Richards, a plastic surgeon in Washington, DC, to serve as a Scientific Director for the Aesthetic Surgery portion of the meeting. At his Washington, DC plastic surgery practice, Dr. Richards focuses on a wide variety of cosmetic plastic surgery procedures ranging from eyelid surgery and BOTOX® Cosmetic to tummy tucks and liposuction. Recognized as the founding surgeon of the minimal incision brachioplasty (arm lift), he has been published in the Aesthetic Surgery Journal for his work in helping patients reduce excess skin and fat on the arms. In addition to serving on the Scientific Committee for the SICAAAMS conference, Dr. Richards will be presenting a surgical course on the procedure to describe how he performs the arm lift technique using an incision on the axilla (armpit). Dr. Richards will also be presenting a course on the cheek lift procedure, a relatively new treatment designed to target the mid-face. He says cheek lifts at his practice have become an increasingly popular way to address concerns with early and late stage facial aging that often cannot be treated with the typical facelift in Washington, DC. He hopes to share his findings and technique with the audience in Geneva. Additionally, Dr. Richards has been given an hour time slot during a mid-morning to discuss the science behind how testosterone is being increasingly used as an anti-aging measure in both men and women. He says he is truly excited about having so many opportunities to discuss his experiences with certain aesthetic procedures and is grateful for the recognition from such esteemed peers. Dr. Mark Richards graduated with honors from Yale University and received his medical degree from the School of Medicine at the University of Maryland. He completed his general surgery residency and plastic surgery residency at the University of Maryland medical school as well. Dr. Richards is board-certified by the American Board of Plastic Surgery and the American Board of Plastic Surgery. He has served as the President of the National Capitol Society of Plastic Surgeons as well as the President of the Montgomery County Medical Society. Located at 11300 Rockville Pike Suite 912 in N. Bethesda, MD, Dr. Richards’ practice, Ageless Impressions Plastic Surgery Institute can be reached at (301) 468-3458. He can also be contacted online via the websites plastic-surgeon.us, faceliftusa.com, or the Ageless Impressions Plastic Surgery Institute Facebook page.